Know how to drive a stick? 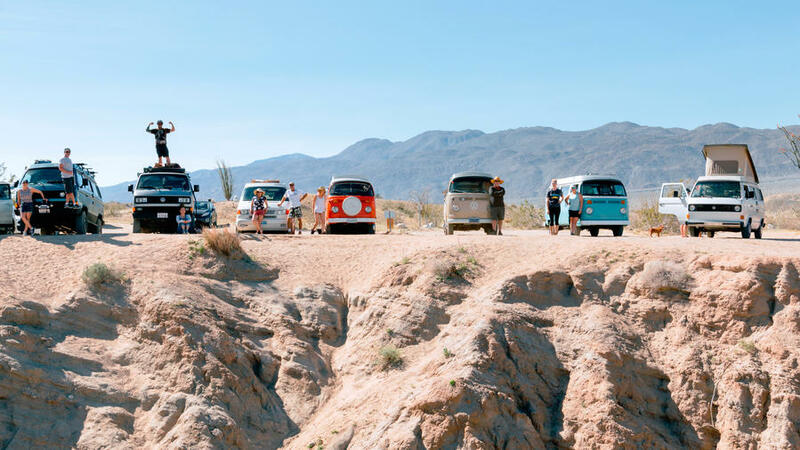 Rent a 1970s Bay Window Westfalia from in Costa Mesa, California, about 105 miles north of Tijuana. The next few hours down Highway 1 and Interstate 5 take you through coastal towns that are pure sand and surf: Dana Point, San Clemente, Encinitas, La Jolla, and San Diego. Once you’re thoroughly sun-kissed, cool off with some TJ nightlife before hitting the (van) sack. From $1,500/week. for Colorado’s majestic peaks and valleys. Drive almost 200 miles to Aspen via Interstate 70 west, spending the night in Maroon Bells, a glacier valley surrounded by 14,000-foot peaks. The next day, take State 82 through the winding Independence Pass to Twin Lakes for hiking. Continue 115 miles on U.S. 50 west to Gunnison National Forest. After a night among the elk, drive on State 114 east to Great Sand Dunes National Park to zoom down the tallest dunes in North America on a sand sled. From $185/night. Take a break from the neon and escape into nature with a hand-painted Maverick from in Las Vegas. Drive 30 miles east on State 167 to Lake Mead for kayaking or biking, then camp out in nearby Valley of Fire State Park, known for its petrified wood and bright red sandstone. Head northeast on Interstate 15 north for 130 miles, cutting through Arizona, to Utah’s Zion National Park to take in the massive pink and red cliffs, as well as The Narrows gorge and Kolob Canyon in the northwest corner. From $141/night. At , the 1989 Westfalia pop tops come with bodyboards and snorkel gear. So no excuses! Make the most of them at nearby Waikiki Beach. Then hit State 83 north along the eastern coast to Ahupua‘a ‘O Kahana State Park’s rainforest trails and coconut groves. Spend the next night at nearby Malaekahana State Recreation Area, a tropical woodland next to picturesque coves and calm currents. Along the way up the coast, you’ll pass Ho‘omaluhia Botanical Garden’s Japanese temple and gardens with koi ponds and a 9-foot-tall Buddha. From $175/night. Sometimes you need a little power to fully explore some of the more rugged national parks. Go farther than your average station wagon with a 2006 Ford 4×4 Sportsmobile from in Jackson, Wyoming, just south of Grand Teton National Park. Head north about 35 miles on U.S. 191 to be in the heart of this national park. Then drive 50 miles on U.S. 287 north to Yellowstone. After camping among the geyser basins, continue 141 miles east on U.S. 14 to Bighorn National Forest for some exploration. Spend the night amid the alpine scenery—spruces and pines, lakes and streams—of Cloud Peak Wilderness area. From $2,550/week. Make it a round-trip! Most van-rental companies require you to return your vehicle at the original pick-up location.